DURET DE CHEVRY DE LA BOULAYE, CHARLES, lieutenant for the king in Acadia, 1685–90; b. c. 1645; d. 1691 ? He was a first cousin of Charles-François Duret de Chevry, marquis de Villeneuve, called the marquis de Chevry (d. 16 Nov. 1712), under whose sponsorship La Compagnie de la Pêche sédentaire de l’Acadie was organized [see Bergier]. La Boulaye distinguished himself as an officer in Flanders in 1677 and by 1685 he was lieutenant for the king in Acadia, replacing Bergier. He was at Chedabouctou, which was the base of operations of the fishing company, about 7 or 8 leagues from Canseau, when Jacques de Meulles*, the intendant of New France, arrived there on 5 June 1686. At Canso, while on the way to Chedabouctou, de Meulles found the fishing company’s ship Saint-Louis which had arrived 8 or 10 days earlier to fish for cod. The establishment of the company at Chedabouctou then consisted of Fort Saint-Louis and several roughly built huts. La Boulaye had 15 or 20 hired men with him there and 3 leagues from the fort three or four inhabitants had cleared and manured 3 acres of land. La Boulaye accompanied de Meulles on his visit to Cape Breton in 1686. So as not to fall into the hands of buccaneers, La Boulaye escaped to Quebec in 1688. In 1689, not having received his pay, he applied for a grant of mines and for a leave of absence to return to France. Although it is said that when Capt. Cyprian Southack* captured Chedabouctou in 1690, La Boulaye was taken prisoner and sent to Boston, where he died, Dauphin de Montorgueil, who was at that time commandant at Fort Saint-Louis, and Bochart* de Champigny reported in 1690 that La Boulaye had returned to France. There is much material on the marquis’s company and on Duret in French archives, among which see: AN, Col., B, 13, f.186; C11A, 1, f.211; C11D, 1, ff.3, 150–70, 195–98; C11D, 2, ff.57–58, 63 (descriptions of Chedabouctou), 165, 176, 185; E, 81 (petitions of the marquis’s heirs, including a memoir giving the history of the company); F, 6, ff.176–77; F, 8, ff.30 226. BN, MS, NAF 9283 (Margry), f.35; NAF 2l395 (Arnoul), f.21. Recensement de 1686 (Acadie). Coll. de manuscrits relatifs à la Nouv.-France, I, II (see Laboulaye). Acadiensia Nova (Morse), I, II. 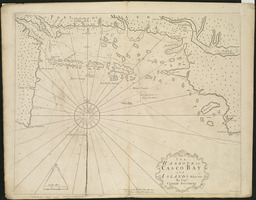 A. C. Jost, Guysborough sketches and essays (Guysborough, N.S., 1950). La Morandière, Hist. de la pêche française de la morue, I, 356–62. Murdoch, History of Nova-Scotia. Webster, Acadia, 205, 208. C. Bruce Fergusson, “DURET DE CHEVRY DE LA BOULAYE, CHARLES,” in Dictionary of Canadian Biography, vol. 1, University of Toronto/Université Laval, 2003–, accessed April 20, 2019, http://www.biographi.ca/en/bio/duret_de_chevry_de_la_boulaye_charles_1E.html.